Finger Licking Food: Cakes and more cakes! The past few weeks have been really hectic with cakes and cooking orders. I've had absolutely no time to pause for a minute and update my blog or try new recipes. Though hectic, it has been worthwhile since I made 3 different themed cakes. The first was a Finding Nemo cake, second was for Easter with Easter treats and the third was a Jungle Theme Cake. All three were a whole lot of fun to do, not to forget work involved in each. 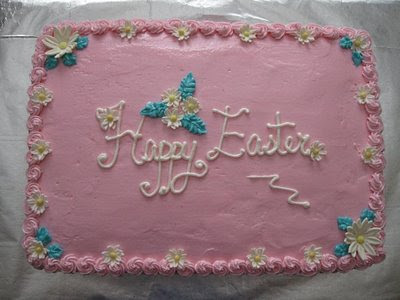 Easter is long gone, but here is what I did for a friend who had us over for Easter dinner. I hadn't quite planned for the basket 'handle' due to lack of time, but I made a makeshift one using mini marshmallows. I also made Rice Krispie Treats using Kellogg's Rice Krispies and mini Marshmallows. The kids loved them. It was one Easter dinner to remember with friends and yummy treats. OMG!! they are just soo gorgeous!! do you cater to parties and all? They all look lovely Nams. Easter basket and rice-krisps eggs are very cute. I always love your cake creations!! The Easter basket is just outstanding!! The look so beautiful; looks like you are really using the cake decoration you did with wilton, my sis is also going for the course ans she is really enjoying the classes. I love the crispie's and Egg basket Cake. Great Work! 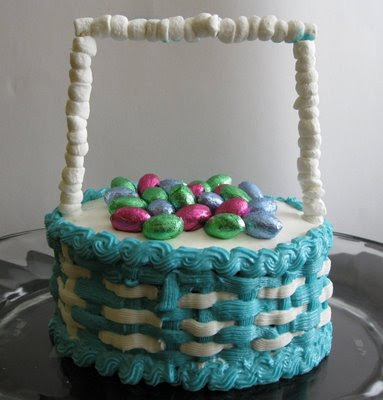 Very Creative..Love the idea of handles of basket..Looking lovely.. The handle is impressive,and the egg very beautiful. Glad to hear that your business is a success. U r so talented! Love the second cake! Very pretty!